← Visit us at Summer Fest tomorrow, Saturday, July 13th! Summer Fest is over…what’s coming up next? 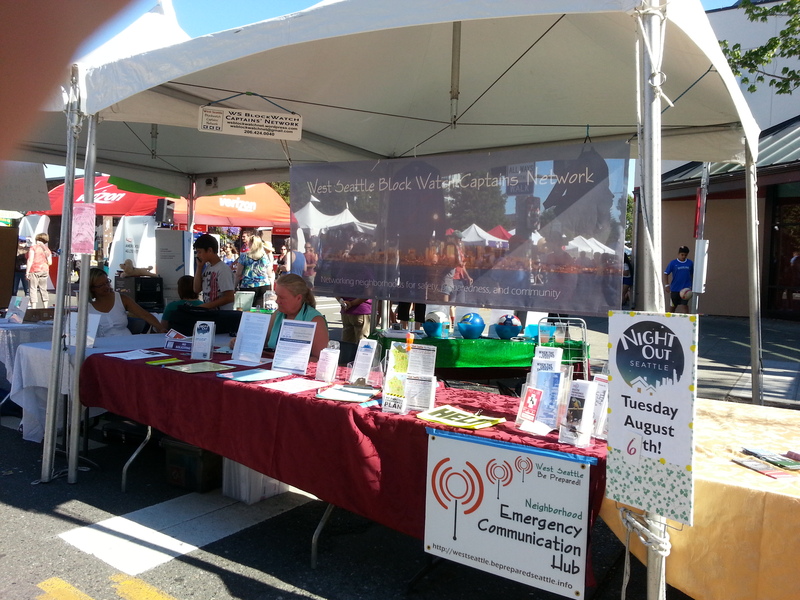 We (Sharonn, Heather, Deb and I) had a great time staffing our booth at West Seattle Summer Fest 2013 this weekend. It was nice to meet so many of you! Thanks for stopping by our booth in the Commmunity Tent at Summer Fest 2013! Night Out block parties (Tuesday August 6th): These happen throughout West Seattle, and beyond, each August on the 1st Tuesday evening. Meeting and talking with your neighbors is an important step in being prepared; in an emergency, you may need to rely on each other for help. If you wish to block off your street for a block party; visit the link above to register your event. Delridge Day AND the SW Precinct Picnic (Saturday, August 17th): Both of these events occur on the same day and offer food, entertainment and activities for kids. Fortunately, they aren’t far apart, so attendees should be able to attend both! We’ll post more details as the day gets closer – we’re planning to have an informational booth at each, so plan to stop by to pick up materials and say hi. Update, 7/16/13: We’ve just learned that these two events will be held jointly. Click here for details. There are other fun West Seattle events this summer (such as the Grand Parade and the Alki Art Fair next weekend), but we’re only highlighting those that are in some way related to emergency preparedness or that our West Seattle Be Prepared group plans to attend. Plan to stop by to pick up “Refrigerator Art” postcard maps that show the West Seattle Emergency Communication Hubs and other informational materials! This entry was posted in Announcements, Events, Outreach events & festivals, Precinct Picnic, West Seattle Be Prepared and tagged Deborah Greer, West Seattle emergency preparedness. Bookmark the permalink.